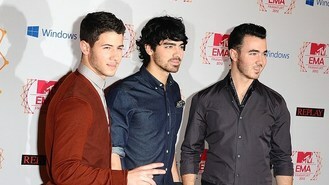 News - Jonas Brothers headed for split? Jonas Brothers headed for split? The move on the social networking site comes days after siblings Kevin, Joe and Nick cancelled their US tour, although their individual accounts are still active. The band's spokesman Jesse Derris admitted to People that he was unsure about their future together, saying: "It remains to be seen." He previously said the cancelled tour was due to a "deep rift". "There is a deep rift within the band. There was a big a disagreement over their music direction," he said on October 9. Music insiders claimed that the trio were looking at their own solo projects. "They are each looking into solo projects. Nick And The Administration are working on another album. They are moving forward away from the Jonas Brothers. I think this is the beginning of the end," a source said. The Jonas Brothers enjoyed huge success after they signed a record deal with Hollywood Records in 2007, even starring together in Disney musical Camp Rock with Demi Lovato, but they have pursued individual projects in recent years. Nick and Joe released solo albums and pursued acting careers while Kevin and his wife Danielle have starred in their own reality series for E!, Married To Jonas.